Goody Goody Goody! It's time for another Peachy Keen Stamps release party! This Friday, we will be celebrating a new batch of PKS goodies (and they are the best yet!). I was so excited by this new release. All of the sets are absolutely wonderful and I know you will all want to get your hands on these babies! My little sneak peek leaves a lot to the imagination. It's a fun action card that you will have to come back to see on Friday. I also have another awesome card tutorial you won't want to miss! Would LOVE to win some of these stamps!!!! Your creations are ABSOLUTELY ADORABLE!!!!!! :)Thanks for having this GREAT BLOG!!!! This looks super cute! Love the glitter. Thanks for a chance to win! Love all your wonderful creations! This sneak peek is beyond adorable!!! That cat/critter looks so happy laughing. I would so love to win some Peachy Keen stamps. Thanks for offering blog candy. Absolutely adorable! These releases just keep getting better and better. Can't wait to see the rest on Friday-love the glitter! looks very cute. can't wait to see the rest. Love this sneak Kim! You really are pulling at our strings! I'll definitely be back to view this action card in its entire-ty on Friday! Is that a bunny I see? I know I see stickles in the peek. I love action cards and love PK stamps so this is going to be a win, win! Love it! Very cute...Can't wait to see the whole thing! Sooo cute. I just can't wait to see it all. Thanks for the chance to win the stamp set. Hi Kim, very sweet, I just love these little faces!! Thanks for the chance to win. Cant wait to see all the new releases!!! Cute peak. Can't wait to see them all. Soooo cute!! 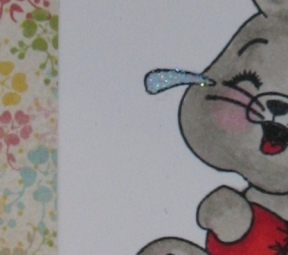 It looks like a really fun stamp... love the glittery tear! Can't wait to see them all on Friday! LOVE PK stamp releases....very exciting! These look great so far! Love PK stamps! Can't wait to see the rest! Am so eager to see all the new releases! I know I'm gonna love these! Can't wait to see the rest! This looks so cute, can't wait to see it Friday night. All the sneak peeks look great! Can't wait for the hop!! Thanks for sharing and a chance to win this set. The little glittery tear is super cute! Can't wait until Friday for the reveal!! That sneak peek looks so sweet! Very cute but can't wait to see all of it. Awww, you sneak peekis adorable!!! I lovethe blog you added to the little mouse's tear.. I can't wait to see your whole project.. This looks so cute, I can't wait to see the rest. Cannot wait to see the reveal! I know you did an awesome job with the stamps. Oh my goodness the coloring on this is super fabulous!!!!! Is that critter laughing so hard she's crying??? Can't wait 'till Friday to find out!! Looks adorable!! Love the little critter and the cute faces. Such a tease, can't wait to see the entire project and the new release! Looks really cute!! She's really laughing hard isn't she! Looks adorable and I can't wait to see the reveal! As I do LOVE animals, I would love to win these stamps. I can hardly wait to see the full set when they arrive at my house. LOL. Seriously I would love to win them and I am now a follower of your terrific site and am looking forward receiving emails when you post new projects. Thanks. I'm looking forward to seeing the new stamps! I can't wait to see this complete. I really like how that flower paper is looking with this image! I can hardly wait to see the complete project. I'd love to win some of the Peachy Keen stamps as I cannot draw a face if my life depended on it! LOL! I can't wait to see the rest. looks so cute. wow what a great peak! cannot wait to see the rest. I should be doing laundry but I am going to hop over to the other blogs for their peak! lol hope I win! alyse d.
Can't wait to see the new releases. I'm excited.